Joel and Ethan Coen have been making films for over 30 years now and, since the mid-1990s, costume designer Mary Zophres has been a key part of creating their distinct aesthetic worlds. Working consistently with the fraternal directing team, Zophres has provided some iconic looks, among them the puffy jackets of Fargo (1996), The Dude’s sweater and bathrobe in The Big Lebowski (1997), and the prison garb of O Brother, Where Art Thou? (2000), to name just a few. The designer’s resume also includes the delightfully quirky and punkish costumes of Ghost World (2001), which have inspired countless young women, and La La Land (2016), for which she received an Academy Award nomination (her second, after being nominated for the Coens’ True Grit). Her latest collaboration with the Coens, The Ballad of Buster Scruggs, features all manner of perfectly stylized western wear, and her accomplishments in design are being fêted with a small but fascinating exhibition of costumes from the film at New York’s Museum of the Moving Image, on view through late May. I spoke to Zophres about her design process and the nature of her collaboration with the Coens. Filmmaker: What were some of the specific challenges that you encountered in working on this film? Zophres: The first read was deceiving—I thought it was a smaller piece of material, but it was actually a big undertaking. The Coens were taking the approach of having six separate but equal stories. I knew early on that we were not necessarily going to change cinematic styles, but the stories that they’re telling are very separate, so it was a challenge. Usually you design your film doing your leads first, then you pull stuff for the background, but this was like designing for six different leads and six different backgrounds. Finance also comes into play. There were times when I tried to economize and share stock between the stories. We used the same cowboy boots on background actors throughout the stories, and we reused suspenders and some of the undershirts. Even in terms of the background stock, I had to think about it like six different movies, and that is probably the biggest challenge. You think you’ve cracked the nut of one and then you go on to the next; there was never a moment of “Okay, I’ve resolved the overall look of this film and now I’m just working on maintaining it.” There were things I did on this film that I’ve never done before and will probably never do again, so that was interesting to me and made it a really exciting design project. Filmmaker: What were some of the things that you’ve never done before? Zophres: The pan-covered costume [from the “Near Algodones” segment]. The amputee costume [from the “Meal Ticket” segment] was another new challenge. 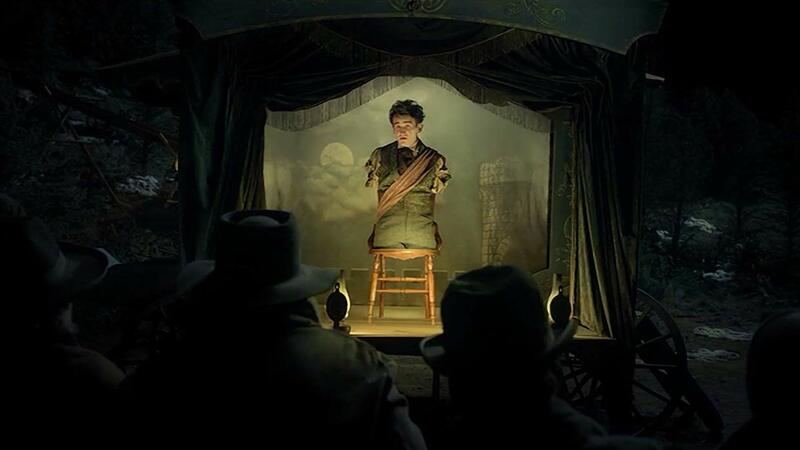 The actor had arms and legs, [so] upon my first read I figured the removal of his limbs would be largely CGI, but [the Coens] wanted to not rely too much on that and see how much we could accomplish [in front of] the real eye. That was a huge challenge, with a lot of trial-and-error and trying to think out of the box. There’s a gentleman that comes from Australia who is a YouTube sensation, and he has no arms or legs. So I looked at his footage to figure out how the clothing reacts to that type of physical handicap. It was interesting and kind of stressful because I wasn’t sure if I was going to be able to pull it off. The Coens really don’t do any camera tests, per se. The actor they cast [Harry Melling] was from London. We had other people staying standing in when he wasn’t there, brought him in well before his segment was supposed to be filmed and had a day or two of working with these different ideas that we had. One of the ideas was having a shirt with four arms instead of two and dropping the shoulders a little bit. So, when Harry was being filmed from the front, he could put his arms back and bind himself, and when we were shooting from the back he could put his arms in front. If you see it at the museum you can see that his shirt has four arms instead of two. Filmmaker: How do you feel about the challenges of designing period versus contemporary costumes? Zophres: There is this long debate amongst designers—some people feel that that period films are more difficult to do than contemporary films. I don’t know if that’s always the case, but period films are traditionally what gets recognized in terms of awards. A lot of times when you do period films, certain clothing you need is still available from rental houses or vintage dealers. The further you go back in time, the less there is available. You end up having to make more, but if your budget doesn’t allow [for that], you sometimes cobble things together. The fact that you have to manufacture more on a period film is one reason why those tend to get more attention as something more difficult to design. Contemporary film has a whole other set of challenges. Oftentimes you end up making lots of stuff for contemporary movies, it’s just that people don’t assume that you made it. From a design point of view, I do prefer films that are quote-unquote “designed,” as opposed to all shopped, because I just prefer designing to shopping, to be honest with you. It allows you some freedom to conceptualize from absolutely nothing and it can be more creative, but not always. I’ve also done contemporary films that are hugely creative. La La Land was an absolute joy to design and we ended up making a lot of clothes, but it’s not necessarily evident—I wasn’t trying to make it look like I had built all the clothes for Emma Stone and Ryan Gosling, but in the end that’s what we ended up doing. She was supposed to be an actress who was struggling and I didn’t want her clothes to look too much like I had built them and they were made-to-order. That’s an example of where the lines sort of blur. When you have a period film, [fewer] people know about period clothing, and in a way that allows you some freedom and some more control. Filmmaker: What is your collaboration with the Coen brothers like? Zophres: The relationship I have with Joel and Ethan has stayed very much the same since the very beginning, and it’s kind of the same as with a lot of the other directors I’ve worked with. With Joel and Ethan, first we have a brief conversation on the phone, then we usually are able to have a meeting in person, a general discussion to get the look. I pull a lot of visuals. It’s before I actually start sketching, usually, but it’s some visual inspiration and they’ll let me know whether I’m on the right track or not. Then I go off and do even more extensive research based on our discussion. I start to compile my boards and do some sketching. Once I have my boards—I do a combination of research boards and boards that have research on them but also have a sketch that tells more of the story—we then have another meeting. My sketches are really springboards to make sure that I’m getting my point of view across. So if they say they have some doubts, I don’t take it personally. What does stay in the running, I communicate to my crew and the actors as they come in, and they look at not only what I’ve put together, but what Joel and Ethan have given the stamp of approval to. Then I start. If there’s a cast in place, you start with them and pull stock. Joel and Ethan are in New York and I’m in LA. If I start to do fittings I email them, and usually we talk more on the phone. Then we meet in person. They were in town one day and we had a huge show-and-tell, which was very helpful. The film has a certain budget so we couldn’t just start making things—I couldn’t afford to make two of something unless we had budgeted for multiples, so I had cloth and sketches. Joel and Ethan are very good visualists and can imagine how the costumes will look. So, I had the leather there for Buster but hadn’t cut them into chaps—things like that. At the meeting there are certain decisions that have to be made—those chaps were hugely expensive, so I need to save money and make sure they saw the leather color in person before I started cutting into it. They’re totally fiscally responsible as well as being creative visionaries. They know that they’ve agreed to make the film for a certain amount of money and they’re not going to go back for more, so every department works under the constraints of staying within the budget. It’s pretty rare that I’ll have a director sitting in on a fitting, but occasionally they’ll want to. We had a few fittings in person with Joel and Ethan on this film. Generally, the process is the same from director to director. I collaborate with the directors most closely. Then, of course, there are the actors and I want to make sure that they feel like their character in their clothes. Ultimately you’re serving the script and the director, I think. Filmmaker: And each of the Coens’ films has such a different look, in terms of costuming. Zophres: I always have said that I feel like I’m the luckiest designer in Hollywood because I get to do such a wide variety of subject matter and characters. They write stories that have very vivid characters, so that’s the freedom, the joy of designing for them, because you are really designing characters. It’s not about fashion but character.